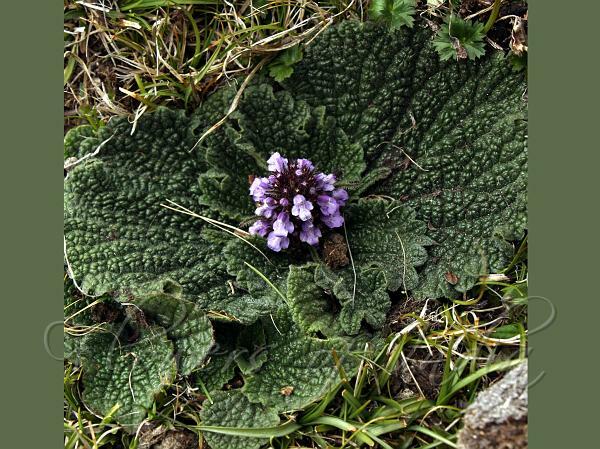 Rosette Sage is a strange looking plant, with a rosette of rounded leathery woolly leaves, lying flat on the ground, with dense cluster of purple-mauve flowers at the center. Flowers are about 1.5 cm, 2-lipped. Upper lip is densely hairy and hooded, and the lower one is longer and entire. Calyx is about 8 mm, hairy, with tiny bristle-tipped teeth, bracts with spiny tips. Whorls of flowers are usually compact and almost stemless but sometimes in vertically separated clusters, borne on stout stem up to 15 cm long. Leaves are kidney-shaped 4-13 cm across, wrinkled with deeply embossed veins above, toothed, abruptly narrowed into a very broad, woolly leaf stalk. Rosette Sage is found in the Eastern Himalayas, from W. Nepal to SW China, at altitudes of 4500-5200 m. Flowering: June-August.